In the first part of the article, I have described a modified ZigZag indicator and a class for receiving data of that type of indicators. Here, I will show how to develop indicators based on these tools and write an EA for tests that features making deals according to signals formed by ZigZag indicator. As an addition, the article will introduce a new version of the EasyAndFast library for developing graphical user interfaces. 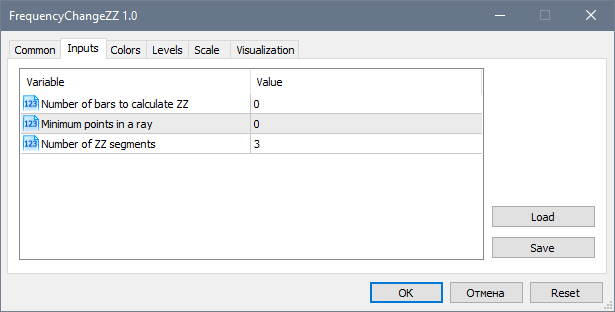 EA for calculating the number of ZigZag indicator segments in specified ranges. Let's consider three indicators defining the price behavior. FrequencyChangeZZ calculates frequency of oppositely directed ZigZag indicator segments formation. SumSegmentsZZ calculates sums of segments from the obtained set and their average value. PercentageSegmentsZZ defines the percentage ratio of segment sums and the difference between them. MultiPercentageSegmentsZZ defines the nature of the formation of several segments from a higher timeframe based on the values of the previous PercentageSegmentsZZ indicator. The code structure of each of these indicators is the same as in the ZigZag indicator described in the first part of the article. Therefore, we will dwell only on the main function (FillIndicatorBuffers) where data is received and indicator buffers are filled. 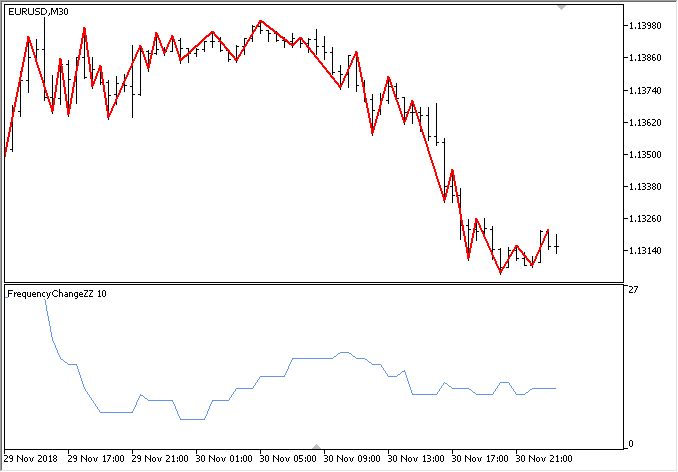 For FrequencyChangeZZ indicator, the code of the main function is the same as in the listing below. Bar index and time array are passed to the function. Next, a necessary number of ZigZag indicator and time array elements (source data) are copied from the current bar time. If source data is received, the final data are requested. After that, it remains only to call a method that returns the number of bars in the segment set. The result is saved to the current element of the indicator buffer. (3) the number of extremums for obtaining final data. All indicators in this article will have the same parameters. The FrequencyChangeZZ indicator displays the chart in a subwindow as displayed below. ZigZag indicator is uploaded on the main chart for more visibility. The indicator clearly displays when the price slows down in choosing its direction. In the SumSegmentsZZ indicator, the main function for obtaining data looks as displayed in the following listing. All is the same as in the previous example. The only difference is that three indicator buffers are filled here for upward and downward segments separately. One more buffer is used to calculate the average of these parameters on the current values. After uploading SumSegmentsZZ on the chart, you will see the result as in the screenshot below. Here we can see that after the blue line exceeds the red one, the sum of upward segments is greater that the sum of downward ones. The situation is reversed if the red line exceeds the blue one. Only experiments in the strategy tester can tell us whether this is a reliable source of info on the future price direction. At first glance, the longer the sum of unidirectional segments exceeds the sum of opposite segments, the higher the reversal probability. Now, let's have a look at the PercentageSegmentsZZ indicator. As in the previous case, three indicator buffers should be filled in the indicator's main function: one buffer each for the percentage ratios of segment sums directed (1) upwards and (2) downwards, as well as one buffer (3) for the difference between these values. The result is shown below. Let's try to interpret it. When the difference in percentage ratios between the amounts of multidirectional segments is less than a certain threshold, that can be considered as flat. In this case, we should also keep in mind that the ratios should often interchange, since the price can shift in one direction for a long time, while the difference is lower than the level selected by the optimizer. In these cases, we should apply the models considering formation of the patterns in a certain sequence. In the previous article, we have demonstrated the EA analyzing ZigZag indicator data from higher and lower timeframes simultaneously. Thus, it was possible to analyze in more detail how the price behaved within the segments from the higher timeframe. In other words, we defined how the higher timeframe segments formed on a lower timeframe. Let's see how this group of parameters will look in the form of a separate indicator displaying these values on the price history. Like in the previous article's EA, we will receive four values of the difference between percentage ratios of the oppositely directed segment sums: one value is for the higher timeframe and three values are for the lower one. The values are calculated by the last three ZigZag indicator segments on the higher timeframe. The colors of the indicator buffers will be the same as in the EA from the previous part. After that, we will develop an EA to test the indicator, so that it is much easier for us to understand what data and for what time period we observe on the chart. The main function for filling in the indicator buffers is implemented as follows. First, get the source data from the higher timeframe specified in the external parameters. Then get the final data and save the parameter value. Next, we consistently get data on the three indicator segments from the higher timeframe. After that, fill in all indicator buffers. I had to develop two separate code blocks, so that the indicator could be correctly calculated on history and on the last bar in real time/tester. Let's make a copy of the EA from the previous article and add a few lines to test the MultiPercentageSegmentsZZ indicator. 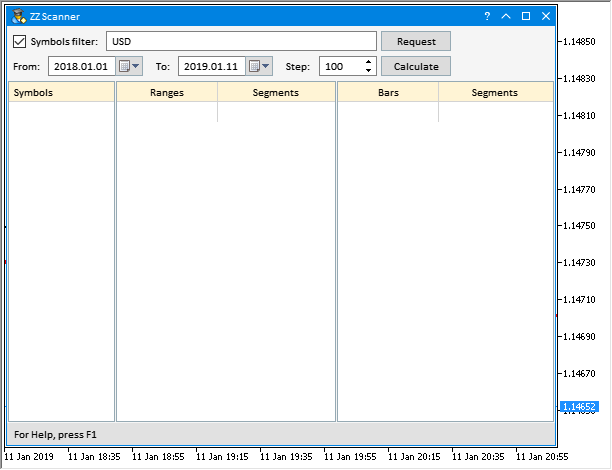 Add the external parameter for setting a higher timeframe. In order for the indicator to be displayed during an EA test in the tester in the visualization mode, it is enough to get its handle. All the indicators described above can be used in various combinations and at the same time on different timeframes. 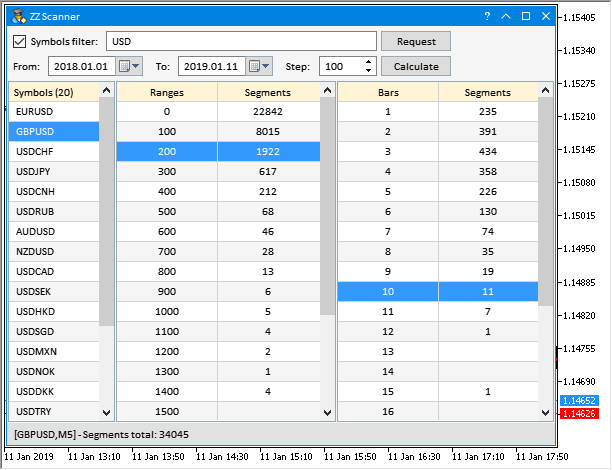 Now, let's use the descried tools to gather some statistics on the set of symbols to understand which of them are better suited for trading in the price channel. Changing the background color of each table cell (CTable class). If the appropriate mode is enabled, a row is not highlighted when clicking on a checkbox in the table cell. Added support for the numeric keypad in the CKeys class. Vertical scrolling in tables and lists. Added the CWndCreate class, which includes basic template methods for quick creation of most elements. It should be used as a base one for the custom class. Using this class allows you not to repeat the declaration and implementation of the same methods of creating elements in different projects, which greatly speeds up the development. Added the check for the correct sequence of creating elements to the CElement class. In the CWndEvents class, the ID is always reset after removing an element. Added the GetActiveWindowIndex() method to the CWndEvents for receiving the activated window index. Fixed the CListView class. Some auxiliary fields should be reset in the Clear() method to avoid out of range arrays in other methods of the CListView class. The new version of the library can be downloaded in the CodeBase. Next, let's create a test EA for gathering some statistics using the new version of the EasyAndFast library. We will start from developing the application's graphical user interface (GUI) and then proceed to methods for collecting and displaying statistics. Input field for sorting currencies that should be collected in the Market Watch window list. Drop-down calendars to indicate start and end dates for collecting statistics. Input field for setting the indicator level. Table to display collected data. As mentioned earlier, the CWndCreate class should be included to the custom class as a base one to develop a GUI faster and more conveniently. The full connection looks as follows: CWndContainer -> CWndEvents -> CWndCreate -> CProgram. The presence of the CWndCreate class allows creating GUI elements in a single line without creating separate methods in a custom class. The class contains different templates for almost all library elements. You can add new templates if necessary. To create a GUI, declare the elements contained in the above list as shown in the following code listing. The current version of the CWndCreate class has no fast table creation template, therefore let's develop this method on our own. If you need to set additional properties, you can do that the same way as shown in the example involving the currency filter input field. Here it is indicated that the checkbox is to be enabled by default right after creating the element. In the case of a table, create a custom method, since it is a complex element with a large number of properties that should be specified before creating an element. It is to feature four columns. The first one will display currency pairs. The remaining ones will show statistical data on three timeframes: M5, H1 and H8. Now let's consider methods for obtaining data. First, we need to get symbols we are to work with. In this EA version, we will receive data from Forex symbols. At the same time, we will exclude symbols, for which trading is disabled. Here we will also need the CheckFilterText() auxiliary method to check the symbol by the filter. In the input field, users are able to enter comma-separated text values that should be present in symbol names. If the field checkbox is disabled or the text is not entered, the check is not performed. If the checks are passed and a match should be found, the entered text is divided into substrings and the search for a necessary string is performed. In the CProgram::GetSymbols() method, pass along all symbols present on the server in a loop and collect the ones fitting the specified criteria into the array. In the general loop, all symbols are deleted from the Market Watch window. Only the ones contained in the array are added to the window afterwards. To obtain data on the collected symbols, we should first get the indicator handles on them. Every time we get the indicator handle, we need to wait until the end of its calculation before copying its data for further analysis. After all the data are received, the necessary calculations are carried out. The CProgram::GetSymbolsData() method is used for that. It accepts two parameters: symbol and timeframe. After receiving the indicator handle, find out how many bars are present in the specified time range. The date range can be specified using the application’s GUI controls. Next, we try to get the amount of calculated indicator data. The indicator calculation may not be completed immediately after receiving the handle. Therefore, if the BarsCalculated() function returns -1, we make new attempts to get a valid value till it is equal or exceeds the total number of bars in the specified time range. After the indicator data are calculated, we can try getting them into the array. It may as well take several attempts until the quantity is also greater than or equal to the total number of bars. If the indicators are successfully copied to the array, it remains only to make the necessary calculations. In this case, we calculate the percentage ratio of the total amount of data to the amount, in which the indicator value is above the specified level. This level can also be specified in the application's GUI. At the end of the method, remove the indicator handle releasing its calculation part. The CProgram::GetSymbolsData() method is called multiple times for a selected list of symbols and several timeframes. Calculation for each of them should be performed only once, and the resulting value is displayed in the GUI table, so the handles are no longer needed and can be removed. Every time a new symbol list is formed, the table needs to be rebuilt. To do this, simply delete all rows and add the necessary amount. The CProgram::SetData() method is used to fill in the table columns with data. Two parameters (column index and timeframe) are passed to it. Here, we move through the cells of a specified column and fill them with calculated values in a loop. The progress bar displays a symbol and a timeframe, the data on which have just been received, so that users understand what is currently going on. The main method for filling the table with data is CProgram::SetDataToTable(). The table is rebuilt here first. Next, we need to set headers and data type in it (TYPE_DOUBLE). Set collected symbols to the first column. Re-draw the table to see the changes immediately. Now we can start receiving the indicator data on all the specified symbols and timeframes. To do this, simply call the CProgram::SetData() method passing the column index and timeframe as parameters. Before receiving new data using the CProgram::GetData() method, we should make the progress bar visible with the help of the CProgram::StartProgress() method. After new data is received, hide the progress bar and remove focus from the pressed button. To do this, call the CProgram::EndProgress() method. When a user clicks Request, the ON_CLICK_BUTTON custom event is generated, and we are able to define a pressed button by the element ID. If this is the Request button, launch the data obtaining process. In the table creation method, we included the ability to sort the table by clicking on the headers. The ON_SORT_DATA custom event is generated every time we do this. When the event is received, the table should be updated to display the changes. The Symbols filter input field is enabled. It indicates that it is necessary to obtain data only for symbols having USD in their names. The data should be obtained within the 2018.01.01 - 2018.12.21 time interval. The Level value used as a reference point for the calculations is set to 30. In this version, timeframes the calculations are performed at are rigidly set in the code: M5, H1 and H8. You can modify and use this application to solve some of your tasks. The table can be filled with any other parameters. Below I will provide another example demonstrating how to improve table data visibility even further. As I have already mentioned at the beginning of this section, the latest version of the EasyAndFast library features the ability to set the background color of the table cells. This allows you to format the table as you see fit the same way as it is done in various table editors. The screenshot below shows formatting data in Excel spreadsheets. Each cell has its own background color remaining at the same value even when sorting arrays. Such formatting makes it possible to quickly perform visual data analysis. Let's make small changes and additions to the MQL application considered above. To set a unique color for each table cell, disable zebra-style formatting. Comment out this code string. Now, let's create the CProgram::SetColorsToTable() method for table formatting. The CColors class is to be used for working with color. It is already present in the library for creating GUIs, therefore there is no need to include the file in the project. Declare two arrays for work: (1) array for obtaining gradient colors and (2) array of colors the gradient is to be formed from. We are going to create the three-color gradient. The lower the value, the more red the color becomes (clrTomato). The higher the value, the more blue it becomes (clrCornflowerBlue). Let's add the white color to separate these two color zones. Define the size of the value ranges from the minimum to the maximum one. This will be the size of the gradient array. The CColors::Gradient() method is used to set the array size and fill it in. Colors of table cells are set in the final loop. In order not to get out of the array range, the index is calculated as the cell value minus the range minimum value. At the end of the method, the table is updated to display the implemented changes. Below you can see how this looks in the GUI. In this case, the results show that the lesser the value, the lesser the number of trends in the considered area. It would be wise to set as wide range of dates as possible in order to obtain information using as much data as possible. The wider the range of dates, the more data are used and, accordingly, the more time it will take to generate data and calculate the parameters. If there is not enough data, an attempt is made to download them from the server. Now, let's develop a program for counting the number of segments by their size. Copy the EA from the previous section and make the necessary changes and additions to it. There will be two tables here. The first one is to use only one column with the list of analyzed symbols. The second one uses two data columns: (1) increasing ranges in points and (2) the number of segments by ranges in the first column. Below you can see how the GUI looks right after the application is uploaded on the chart. The Request button requests the symbol list by a specified filter. When clicking Calculate, data from the specified time range are collected and distributed in the second table. Basically, all the methods have remained the same as in the previous EA, so let's consider only the things related to the second table. First, we need to receive the indicator data. This is done in the CProgram::GetIndicatorData() method. 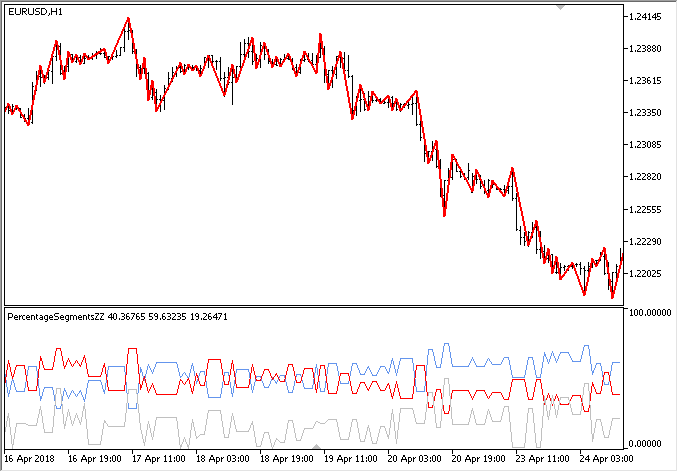 Initially, we connect to the ZigZag indicator and then get its data in the specified time range. 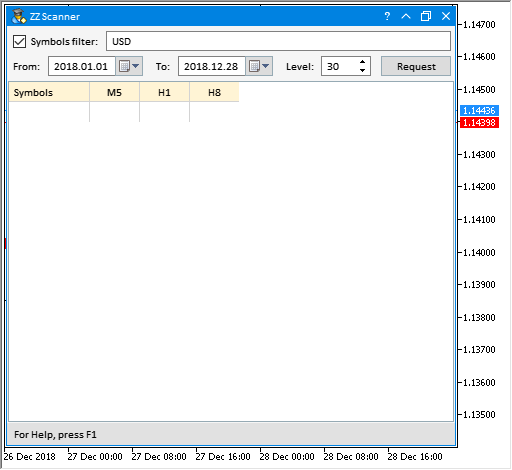 Symbol, timeframe and the number of obtained indicator segments are displayed in the status bar. Price ranges with a specified step should be calculated for the first column. The CProgram::GetLevels() method is used for that. To define the number of ranges, we should first obtain the maximum segment size in the obtained data set. Next, fill the array with levels using a specified step in a loop till the maximum value is reached. The CProgram::SetDataToTable2() method is used to fill in the second table with data. At the very beginning, the check is performed on whether the symbol is highlighted in the first table list. If it is not, the program exits the method sending the message to the experts log. If a row in the first table is highlighted, define the symbol and get data on it. After that, the methods described above are called for receiving the indicator data and calculating the levels. We receive the indicator data with the same timeframe the EA is launched on. When we know the number of levels, we are able to build a table of the required size and fill it with values. First, fill in the first column with range values. After that, fill in the second column. By sequentially moving through all the ranges, increase the counter in cells for the segments fitting in this range. As an example, let's receive segments for EURUSD since 2010 up to present on M5 chart. Set ranges with the step of 100 five-digit points. The result is shown on the below screenshot. The total number of segments is 302145. As we can see, the maximum number of segments is within the range of zero to 100. Further on, the number of segments is decreased from level to level. Within the specified time period, the maximum segment size reached 2400 five-digit points. It would also be good to know the duration of segments in the formed groups. To find any patterns, we need to have all the statistics on the analyzed data. Let's develop another EA version. Simply copy the program from the previous section and add another table to the GUI. The table is to feature two columns: (1) number of bars and (2) number of segments with that number of bars. Below you can see how the GUI looks right after the application is uploaded on the chart. Click Request to receive the symbol list. Select a symbol highlighting a row in the first table. Click Calculate to receive data for the second table. To receive data for the third one, select the necessary range highlighting a row in the second table. The listing below provides the code of the CProgram::SetDataToTable3() method for receiving data and filling the third table. The highlighted row here is used to receive the range, within which the number of segments is to be calculated by their duration. The number of rows in the table is defined by the longest (in bars) segment out of the obtained data set. When filling in the second column of the table, move through all the rows and count the segments fitting the selected range and number of bars by size. When highlighting table and list rows, the ON_CLICK_LIST_ITEM custom event is generated. In this case, we track the arrival of the event with the second table's ID. When receiving a new list of symbols or calculating data on the new highlighted symbol in the first table, irrelevant data from previous calculations should be cleared out of the tables to avoid confusion about what data are currently displayed. After launching the EA on the chart, we obtain the result as shown below. In this case, we formed the list of currency pairs featuring USD. 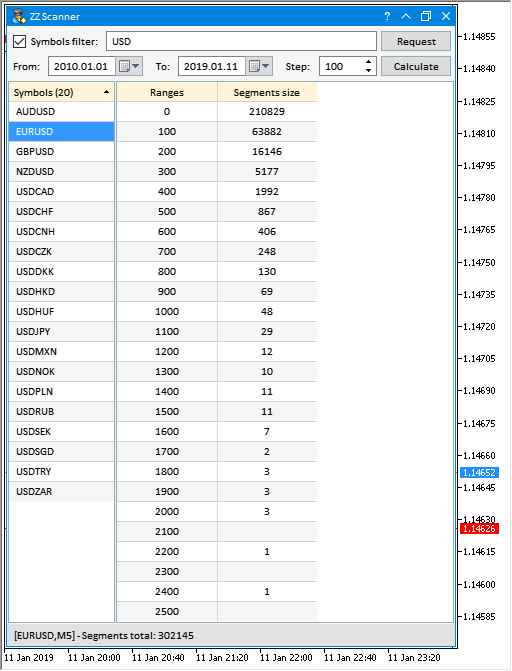 Data on GBPUSD from the beginning of 2018 were received afterwards and the range list (second table) was formed with the step of 100 and calculated segments for each of them. As an example, the row with the range of 200 and the number of segments of 1922 (from 200 to 300) is highlighted in the second table. The third table displays duration of all segments from the range highlighted in the second table. For example, we can see that only 11 segments with the duration of 10 bars from the specified range were present on GBPUSD during this period. 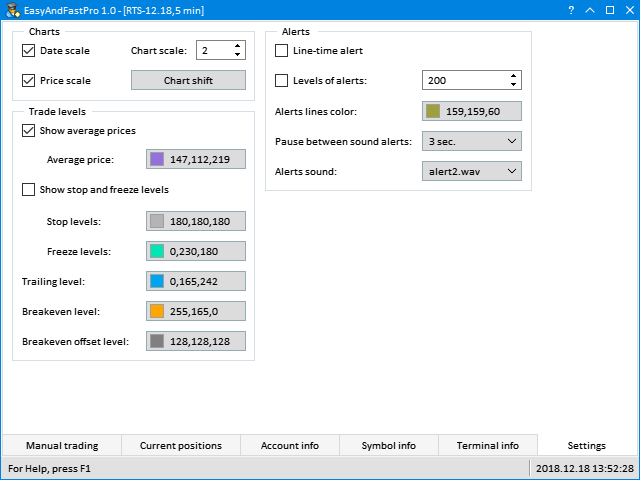 As a supplement, I would like to show how to properly handle the event of changing a chart symbol and timeframe when a GUI is used in an MQL program. Since GUIs may contain multiple various controls, it may take some time to upload and initialize the entire set. Sometimes, this time can be saved, which is exactly the case with changing a chart symbol and timeframe. Here, there is no need to constantly remove and create a GUI over and over again. 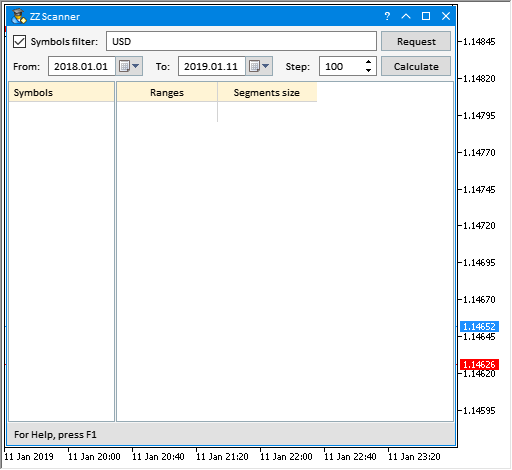 During the deinitialization, the GUI is removed in all cases, except for the ones where the reason is REASON_CHARTCHANGE. Since the GUI is created when initializing the program by calling the CProgram::CreateGUI() method, it is now sufficient to check the last cause of deinitialization. If the reason is that a symbol or timeframe has been changed, then there is no need to create a GUI. Instead, simply exit the method notifying that all is well. The idea that ZigZag is not suitable for generating trading signals is widely spread on trading forums. This is a big misconception. In fact, no other indicator provides so much information to determine the nature of the price behavior. 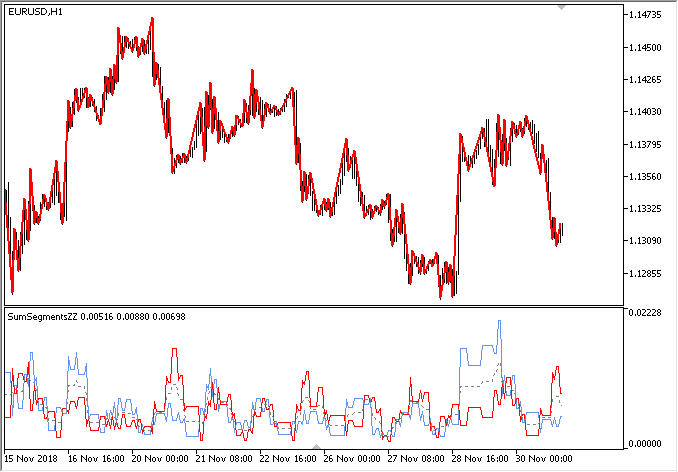 Now you have a tool allowing you to easily obtain all the necessary ZigZag indicator data for a more detailed analysis. In the next part, I am going to show what other data can be obtained using the tools developed in these articles. In this article, we will consider popular candlestick patterns and will try to find out if they are still relevant and effective in today's markets. Candlestick analysis appeared more than 20 years ago and has since become quite popular. Many traders consider Japanese candlesticks the most convenient and easily understandable asset price visualization form. Many researchers do not pay enough attention to determining the price behavior. At the same time, complex methods are used, which very often are simply “black boxes”, such as machine learning or neural networks. The most important question arising in that case is what data to submit for training a particular model.